For more than 50 years model rocketry has helped teachers inspire and educate students. Building and launching a real rocket powered by a real rocket motor provides a “hands-on” experience creating a unique learning experience. Rocketry promotes creativity, introduces technology and engineering, dramatically illustrates physics, provides a framework for experimentation, and more. Estes offers a Guide For Teachers and Youth Group Leaders which you may download and print. The guide (click here to download) provides a solid introduction to model rocketry tailored for teachers and leaders of youth groups such as Scouts. Another document available from Estes, Science and Model Rockets, describes a curriculum for fifth through eight graders which uses rockets to teach basic physics concepts such as Newtons Laws of Motion. Additional resources, including lesson plans, for K-12 teachers are available in the Education section of Estes’ web site. Our local rocketry clubs offer assistance to teachers and other youth leaders wishing to use rocketry as a group activity or as curriculum. 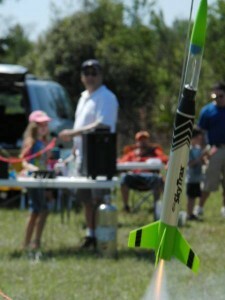 ROCK, the club which holds rocket launches on the first Saturday of each month in Oviedo, is the club which most actively supports K-12 groups building and flying model rockets (including TARC competitors). ROCK members have helped teachers and students with rocketry projects in the classroom and at the club’s launches. ROCK has also provided support to Scout and Civil Air Patrol members and groups. NEFAR (which launches on the second Saturday of the month in Bunnell) and SRA (which launches on the third Saturday of the month in Palm Bay) have provided support to college and university groups including participants in NASA’s Student Launch Initiative. For help with a rocketry-oriented youth project, please Contact Us and we will try to answer your questions or connect you with a local rocketry club officer or member who can provide assistance.